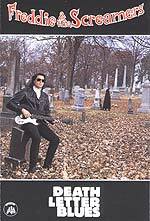 CD reviews: "Deep Blues" and "Death Letter Blues"
These reviews first appeared in the Winter 1994 edition of Blues Revue Quarterly magazine (now Blues Revue). 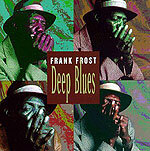 Veteran bluesman Frank Frost has been under-recorded throughout his career; this new recording is a welcome addition to his catalog. The best news is that Frost's vocals and harp playing are as strong as ever. The backing band of Freddie & The Screamers provides solid support. Producer/guitarist Fred James provides nice fills and solid rhythm, and has enough sense and respect to stay out of the way and let Frost star. Drummer Waldo Latowsky sets a solid back-beat, and Bob Kommersmith's acoustic bass lends a nice swing. As mentioned, though, Frost is the star and his performance here is outstanding. An excellent harpist, Frost is comfortable in a variety of settings, from hard-blowing Chicago blues through boogie shuffles and slower pieces. He's as convincing on a ballad as he is blowing like a locomotive. His voice is a sweet tenor that complements his harp playing. If he's short on range, he knows how to get the most out of what he does have. Frost wrote all the songs here; they are solid, hook-laden blues tunes that lend themselves well to Frost and the band's renditions. Frost's traditional electric blues draw much from postwar Chicago electric blues with some '50s R&B and Southern soul thrown in. The Freddie & The Screamers release is more mainstream hard rock than blues. James is a sharp guitarist, but isn't as strong as vocalist. His nasal voice is reminiscent of Paul Rodgers (Bad Company, Free) without the range. But since James is the visionary behind Appaloosa Records' U.S. recordings, this album is interesting to check out just to see where his sensibilities lie. Where they lie is firmly in the Southern blues/rock tradition of the Winter and Allman brothers, with a dash of Molly Hatchet and the Righteous Brothers.